Do you have PTSD, traumas, distressing experiences or memories, nightmares, phobias, OCD, panic attacks or somatic symptoms? Feel stuck in recurring patterns, scared, depressed or anxious? EMI can be a dream come true! Finally a healing treatment that works effectively, efficiently and can be permanent. Call us to book a consultation to see if EMI is right for you! When a client’s current problems are deeply rooted in memories of distressing experience, retrieving and expressing those memories is often an arduous and painful task. EMI is a therapeutic approach that uses guided eye movements to assist a client to access recorded information in all its multisensory, cognitive and emotional forms. EMI recruits these resources to the integration and resolution of distressing experiences and their problematic psychological consequences. The impressive efficacy and rapidity of EMI derives from its ability to help the mind do precisely what it was designed to do: heal itself using its own inner resources. 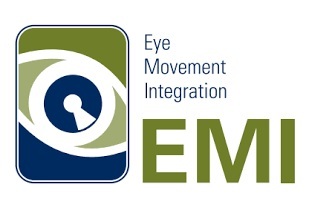 This natural, eye-movement-assisted process of integrating painful memories into the greater context of the individual’s life experience is the essence of EMI. One of the tenets of EMI is that our spontaneous eye movements reflect our thought patterns and, in particular, that the direction of each eye movement is related to the sensory content of the thought or memory. Classically, for example, gazing upward and to the left is associated with remembered visual images, while gazing downward and to the right is associated with kinesthetic feelings such as emotions, touch, visceral sensations, and muscle movement. Distressing experience affects the mind differently than ordinary experience does. In threatening or intense situations, an alternative “emergency” pathway is invoked. Information from the thalamus can be sent directly—via a single synapse—to the amygdala, part of the primitive reptilian part of the human brain, which initiates survival behaviors and emotional responses a split second before the information can reach the more distant frontal lobe and form a clear perception. Essentially, nature has designed a shortcut to permit quick reactions in the face of a sudden threat, based on a “quick and dirty” reading of the sensory information by the amygdala. If the amygdala perceives a threat message in the unprocessed sensory information, it sends out signals to the brain and endocrine organs to initiate the “fight or flight” response. It shuts down non-essential functions and triggers a jolt of adrenaline that tenses the muscles, sets the heart racing, quickens respiration and in general readies the body to deal with whatever terrible thing is about to happen. If it later turns out that the sinuous object on the forest path was not a snake but just a curved stick, the frontal lobe will send out signals that permit the body to relax, climb down out of the tree it had jumped into, and eventually let the heart beat and breathing return to a normal rhythm. The central roles of the hippocampus and the amygdala usually work hand in hand. Moderately elevated activity in the amygdala causes improved connectivity of the hippocampus, and heightened potential for learning. Excessive stimulation of the amygdala by overwhelming experience, however, causes impaired hippocampal functioning due to the intensity of the neuroendocrine stress responses. This means that the hippocampus may not be able to coordinate the sensory and emotional information received during a crisis into integrated memories. The end result is that traumatic memories are often recorded as fragmentary, nonintegrated bits and pieces. The conversion of these nonintegrated memories into integrated form is thought by many psychologists to be essential for recovery from the psychological impact of the traumatic event. Many clients have had key experiences in their lives that have left enduring imprints in their multisensory memory networks. Not all survivors of abuse, trauma or other distressing episodes will have trouble integrating the memory, but for many the traces remain paradoxically strong and fragmented simultaneously. In the most severe cases, traumatic memories can contribute to severe mental disturbances such as dissociative disorder or posttraumatic stress disorder. In milder cases, anxiety or depression may be the only sign. The spectrum of symptoms that may stem from unresolved memories of distressing events also includes nightmares, flashbacks, emotional numbing, avoidance behaviors and panic attacks. EMI is useful for treating any constellation of symptoms or difficulties that can be reasonably traced to a traumatizing incident or period of the client’s life. EMI seems to be able to facilitate access to these troubling, nonintegrated memories, by circumventing the routine patterns of thought and avoidance that the client has habitually followed. Figuratively speaking, the eye movements appear to redirect the client’s mind into dusty corners that have been neglected, releasing information—whether painful or healing—that can then be naturally incorporated into a new, healthful perspective on their current life and their past experience. It is almost as if EMI activates an inner homeostatic guide that leads the client out of the maze of their troubling memories. The varying patterns of eye movements, the reassuring environment of the therapist’s office, and the focus on the sensory, cognitive and affective aspects of the memory—all of these ingredients combine to produce an astonishingly effective intervention. The treatment begins with the client concentrating on a particular memory that appears to be central to his experience: a highly emotionally-charged episode, or the earliest memory of a repeated trauma; or the first scene in a sequence of recollections of a single distressing event. The guided eye movements are begun by moving the hand, with two fingers extended or holding a bright marker, at a distance and rhythm that the client is comfortable following. Because it is not possible to accomplish this within the sixty minutes of a typical therapy session, we try to schedule 90- to 120-minute sessions for EMI. Often, complete resolution of problems related to a single traumatic event can be achieved in one session, and the most complex cases I have seen were successfully treated with a total of only six or seven sessions. Many clients will report increased dream activity, or surprising, illuminating insights, or dramatically altered behavior in the days and weeks that follow an EMI treatment. A follow-up session permits the therapist to assure that no problematic memory circuits remain to be treated, and that the outcomes and repercussions of treatment are beneficial for the client. Studies found that, on average, a single treatment with EMI could reduce post-traumatic stress symptoms by 48%, while a full course of treatment reduced symptoms by 83%. These results are confirmed every time a client troubled by unresolved distressing memories seeks help from a skilled EMI practitioner, releasing the client from the burden of the traumatic baggage. The above description is a partial description based upon Danie Beaulieu’s, PhD, work. She has been a leader in the field of EMI.